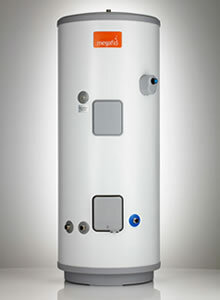 Heatrae Sadia Megaflo hot water cylinders are one of the top and the most well known unvented cylinders on the market. Unvented cylinders get the name simply by the fact they have no form of open vent to allow for expansion so it is therefore a pressurised cylinder. Pressurised cylinders can either have an internal air gap inside the cylinder that takes up the expansion or they can also have an external pressure vessel that works that same way but arguably takes up extra space. The stainless steel that is used on Megaflo cylinders have a superior resistance to corrosion especially in areas where the water is aggressive. This ensures the longest possible working life span for the cylinder. Megaflo have various models on the market with different hot water storage capacities to meet everybody’s needs. They in fact have seven available capacities of cylinder ranging from 70 litres to 300 litres in both indirect and direct systems. They are a mains water fed cylinder with a highly efficient hot water recovery rate and require a minimum of 20 litres a minute flow rate and 1.5 bar of pressure. If you are fed up with a shower pump screaming away every time you run a tap or have a shower, perhaps you own a large property and could do with the extra pressure then maybe have a read up on Megaflo cylinders or give us a ring and we can and discuss the possible options for your circumstances.